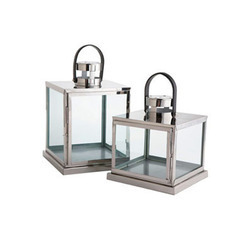 We are a leading manufacturer & Supplier of Crystal items.The same T-light Lantern is in Iron with Nickel plated finish and are decorative with Crystal. 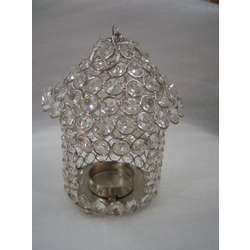 Owing to our in-depth knowledge in this domain, we are specialized in providing Laxmi Tea Light Lantern. We have gained tremendous expertise in this domain and are manufacturing and exporting Lantern candle lamps. They are highly capable of enhancing the overall beauty of the interiors and are offered in various color contrasts, designs, sizes and specifications. We are one of the reputed manufacturers of premium quality lanterns. Cheap and best durable item, can be done in any color as per requirement. Sheet Iron Dye Cutted Pumpkin T light Holder. Give a touch of elegance to your home, office or any other space with this chic Tealight lantern. Place a few of these on your rooftop or in your garden when throwing a party for a wonderful ambience. The subtle color shade of the glass gives it a very attractive look. Mesmerizing meets tranquility; This Floral Cut Taupe Ceramic Tea light Lantern Shade is an exquisite tea light holder; When the candle is illuminated within, the light travels through the openings and casts a glow of the Floral Cut pattern on your walls.